Rectangles can be seen everywhere…in the shape of a piece of paper or a table or a birthday cake. 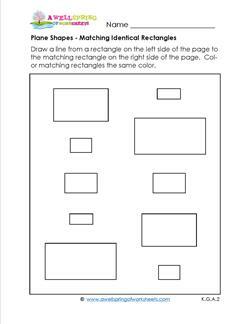 Our rectangle worksheets cover the skills needed to identify rectangles on the page or in the classroom. 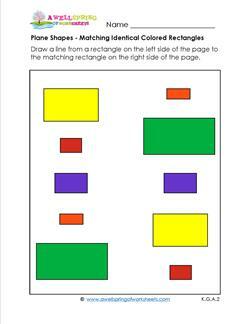 Color, match and draw rectangles with these worksheets. Don’t forget to talk about the matching sides and their lengths. How many sides are the same length and how many different lengths are there in a rectangle? How is that different from the sides of a square? 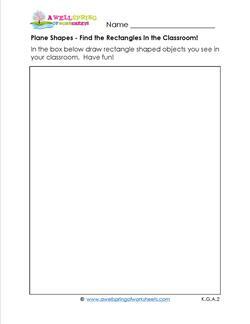 Please go to this page to see all the kindergarten geometry worksheets. 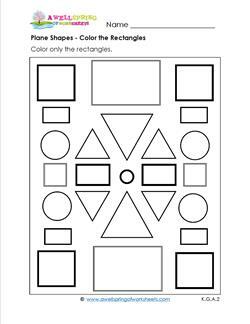 Kids color only the rectangles in this worksheet. You may want to introduce the word "symmetrical" as these shapes are symmetrically arranged. This worksheet asks kids to put and X on the rectangles. Hint - there's only five of them! 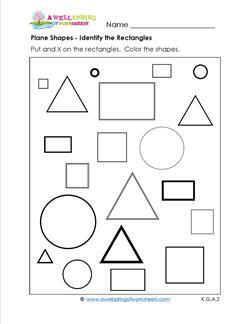 Can kids say all the names of the shapes? Color the shapes. Take a look around your room. How many rectangular things do you see? Start drawing those things in the box. Share them with your friends and classmates! Have fun! 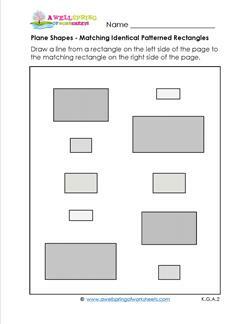 Draw a line from a rectangle on the left side of the page to the matching rectangle on the right side. Color matching rectangles the same color. Draw a line from a colored rectangle on the left side of the page to the matching colored rectangle on the right side of the page. Draw a line from the patterned rectangle on the left side of the page to the matching patterned rectangle on the right side of the page.